I am interested in any expansion for CARC2. According to a twitter post from Dice Tower at GenCon, Stone Age 10th Anniversary Edition is coming out! The Box says Limited Edition, and the display tag Release Date: Late 2018. Right next to Stone Age 10th Anniversary Edition sits Carcassonne: Safari with the same estimated release. Here is a twitch video of GenCon and at approx. 4:35:00 Stone Age 10th Anniversary Edition is featured. In the video, He asked the guy at the booth about the differences between Standard and Anniversary. It does not seem to include The Expansion (Style is the Goal), The Casinos, or The Mammoth Herd. 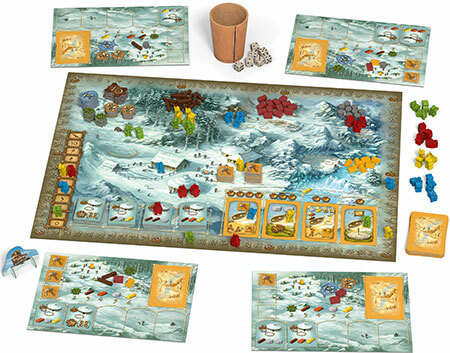 In this case I hope they release a 10th Anniversary Edition of The Expansion (Style is the Goal) with a double sided board (Original/Winter Theme) as well. BoardGameGeek has the original post where people are talking about it. I personally love Stone Age and I have The Casinos and The Mammoth Herd Expansions, but not Stone Age:The Expansion (Style is the Goal). I saw the BGG post and some of the video content. Being a big fan of the game I'm interested in this edition and think it is a nice idea!. My wife and I play with all mini expansions in, including the latest Mammoth and the larger 'Style' expansion. I would hope and assume that these expansion bits fit into the anniversary edition game design. 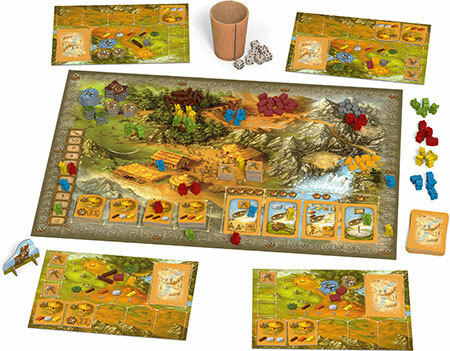 The familiar family game STONE AGE is 10 years old. On the occasion of this anniversary, this limited and revised edition will be published. The game includes the well-known summer version and a winter version, which is played with a variant. There are also two mini-extensions "The Wild Animals" and "The Igloos". Start an exciting journey into the past. Truly hard were the times when our ancestors still walked bent behind the wooden plow. But progress was not stopped even then. Good tools and high-yielding plants made work easier and life enjoyable. From the images it appears that the Board, Player Boards and the Huts are double-sided with the winter art on the other side. The cards look the same. The Food Tokens are no longer disks, but have new fancy shapes. I can't tell if the Meeples are any different other than shades of color. We will have to wait and see what the Winter Variant and the two mini-extensions "The Wild Animals" and "The Igloos" are. 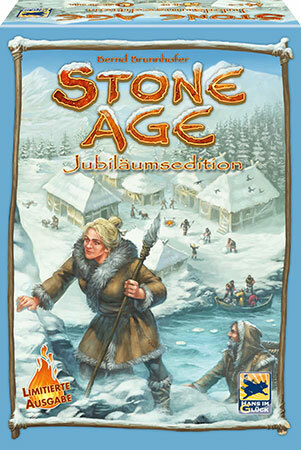 ZMAN Games has now published an article ANNOUNCING STONE AGE ANNIVERSARY! Stone Age Anniversary will be $79.99 and release in Q4. This pull out quote is the most intriguing, "... new options for playing in the bitter cold of winter". Overall this is great news for anyone looking to get into the game. In regards to the price, sadly, it seems to be in-line or nearly on par with many new releases, (especially where Zman and Asmodee is concerned). Estimated Release Date: December 2018. I plan on selling my Standard Edition of Stone Age once I receive the Anniversary Edition. I've only owned it for a few Months (March 2018) and it is in Excellent Condition. I toke this new edition, but I can't find the rules in english... I need them only for the animal cards, the igloos and the rule for the gold on the cards spaces... Can someone help me? It'ok also a quick translation from german. Ciao Aenima, le regole ufficiali della versione inglese non sono ancora state pubblicate da Z-Man, per cui mi limito a tradurti in sintesi le poche novità della versione invernale. Hello Aenima, the official rules of the English version have not yet been published by Z-Man, so I limit myself to briefly translate the few innovations of the winter version. Even the English translation is quite clear, I hope this can help someone else! Here is a video showing the components up close and what the new items, changes and variants are. 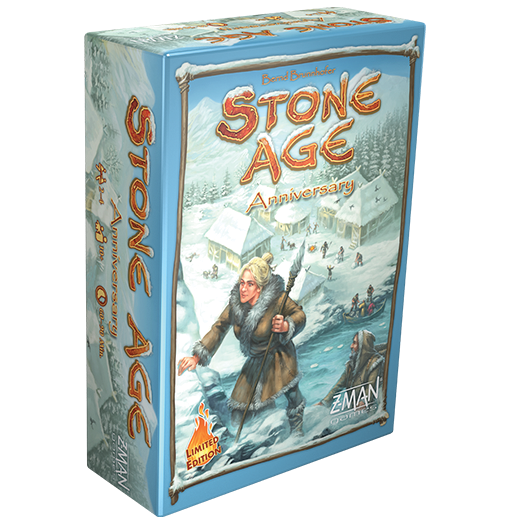 ZMAN has updated the Stone Age Anniversary product page. I emailed ZMAN about their Upcoming Games Page needing an update and they did so. I also asked about more news on the anniversary edition. Here is the Article they just released. According to Gameology.com.au the Release Date is January 2019. Miniature Market has changed their Estimated Release Date to: January - March 2019.